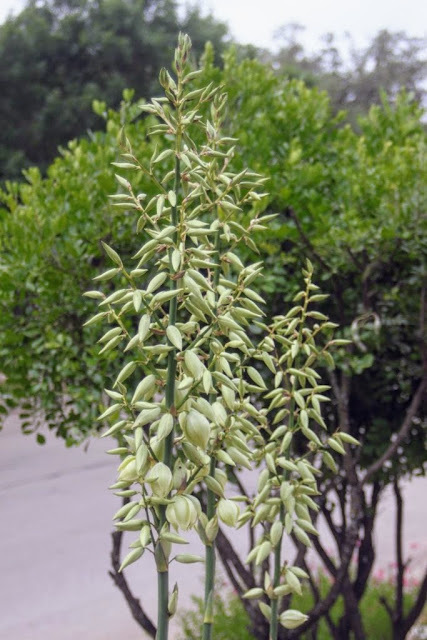 Those yucca blooms keep drawing me outside, even though I'm trying to blog more (by request). But whenever I sit at my computer I see this view! 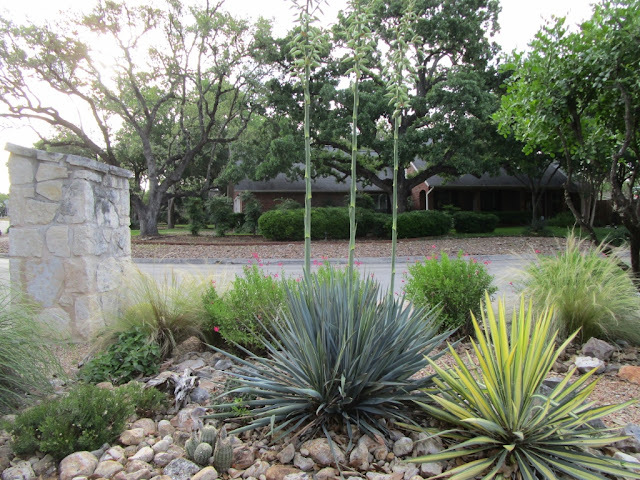 Silvery Yucca rupicola is blooming for the first time having been planted as a small pup about four years ago. Sometimes yuccas go on the wane after blooming, fortunately it has produced a number of pups to keep going should the originals die out. Since I'm already out here let's take a tour of the spring garden which I'm linking to End of Month View hosted by Helen at The Patient Gardener. 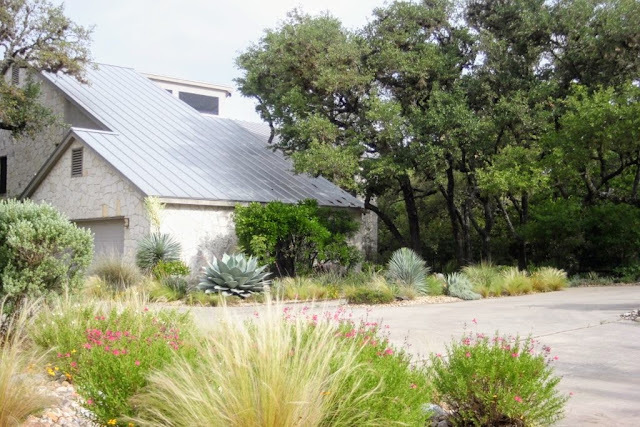 Helen and several other UK bloggers are making the trip to Austin for the annual Garden Blogger's Fling. 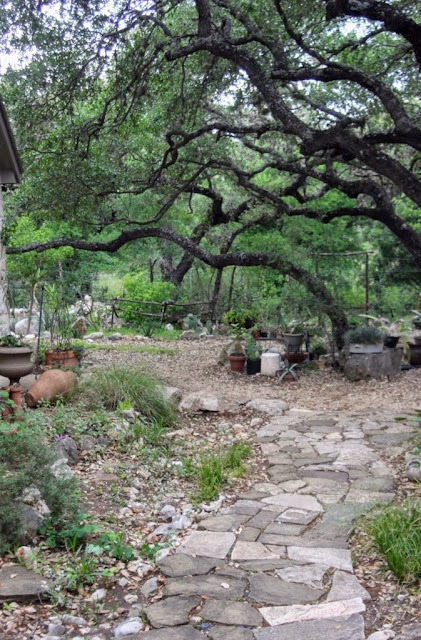 I look forward to meeting so many bloggers I know mainly from photos of their gardens. It's been a good spring with cool to average temperatures featuring more than a few cloudy days. Clouds are good because we will have endless sunny days all summer. For now we can use the extended opportunity to get seedlings and transplants off to a good start without a pounding from hot sun. Just enough sun breaking through momentarily to show off Mexican Feathergrass inflorescences with pink Salvia greggii. This is the view we see most often when returning home and I love the way everything has worked out. I'm pretty much done and any tweaks will be minor from now on. 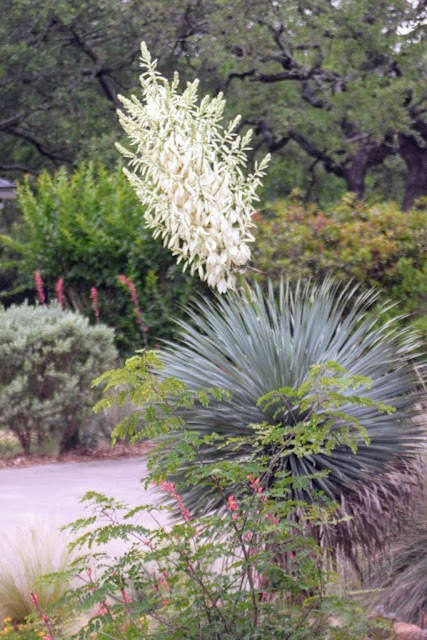 More than one yucca bloom is on the way! Yucca rostrata by the garage is happy enough to bloom during its first spring in the ground. Straight on front view showing lots of green and silver. Later in the year yellow and gold flowers fill in as the green of spring fades. 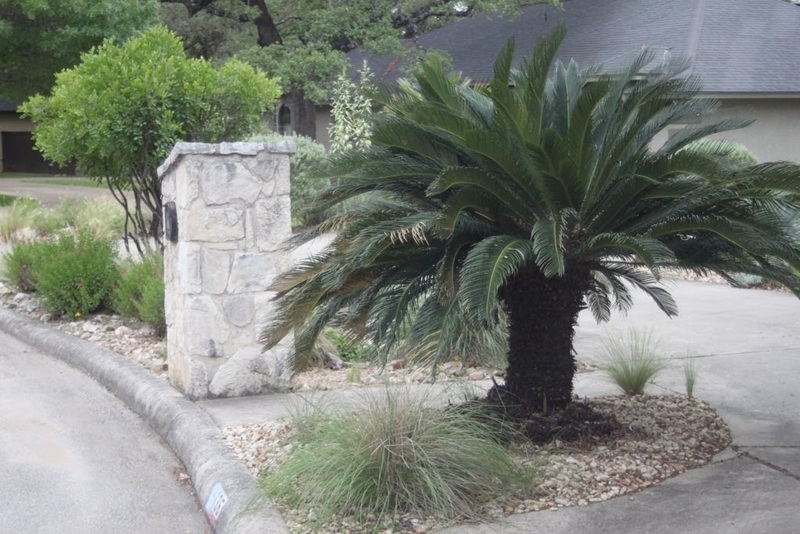 Experts advise against pruning up the Cycad. 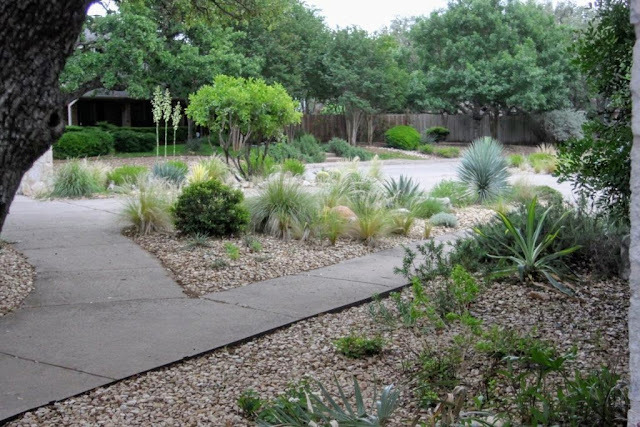 But they don't have to get to the mailbox through all those prickles. So prune we did. Entering from the north end of the drive. A little deer proofing to protect Agave cornelius planted to replace Yucca filamentosa 'Color Guard' which bloomed and died out. The garden needs a spot of yellow and green color here and the agave fits the bill. 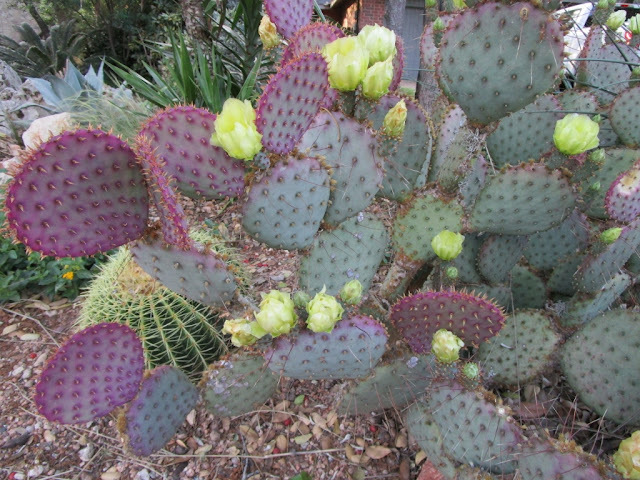 Pale yellow blooms on purple pads of Opuntia Santa-rita creates a perfect complementary scheme. The island bed in silver awaiting more gold flowers later in the summer. 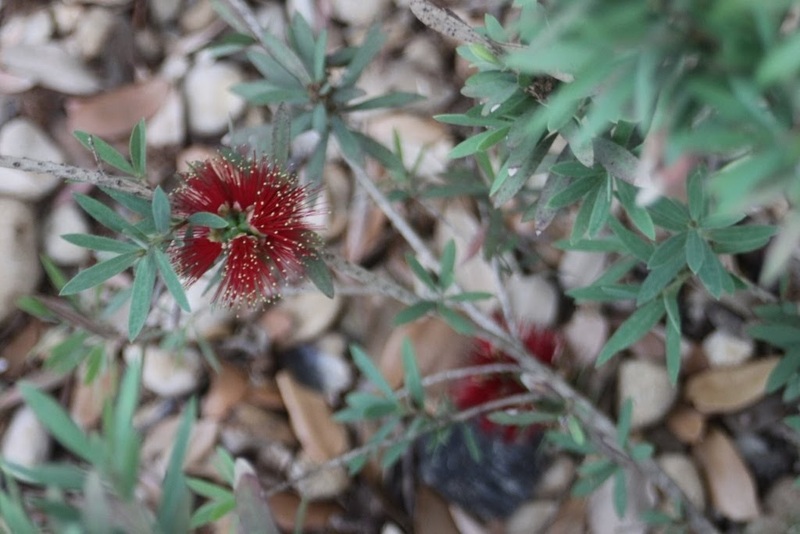 Callistemon 'Little John' nearly froze to death in a rare snow fall last December. I'm happy to see it has recovered well enough to bloom. 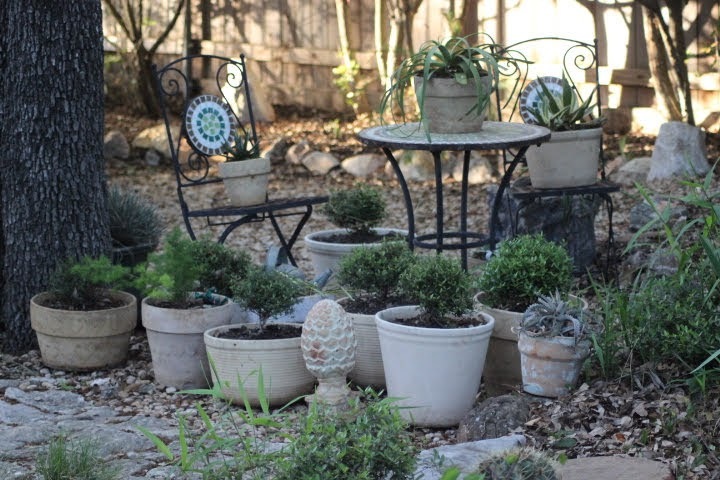 Down through the courtyard garden collection of vintage white clay pots which coordinate much better with Ilex vomitoria 'Grmicr" or "Micron Holly" instead of a random collection of plants. 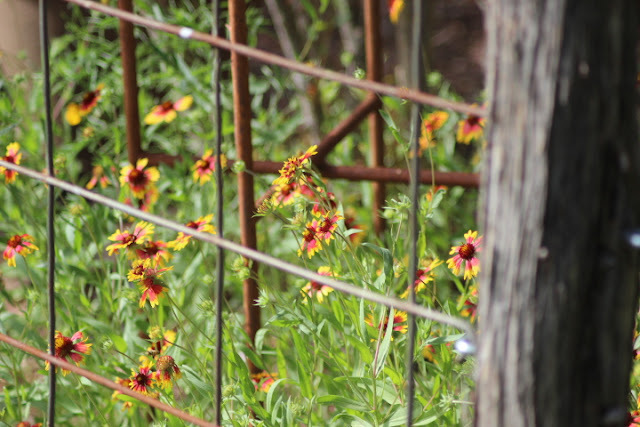 Wildflowers have changed over from Bluebonnets to oranges and yellows of Greenthread, Firewheel, and Mexican Hats. I've tidied up the "Flower Bed" and added Salvia guaranitica 'Amistad' in a pot to better watch hummingbirds from the porch. The view from the porch where I spend a lot of evenings watching darkness cover the garden. The beginnings of a wildflower meadow on a scruffy slope below the deck. 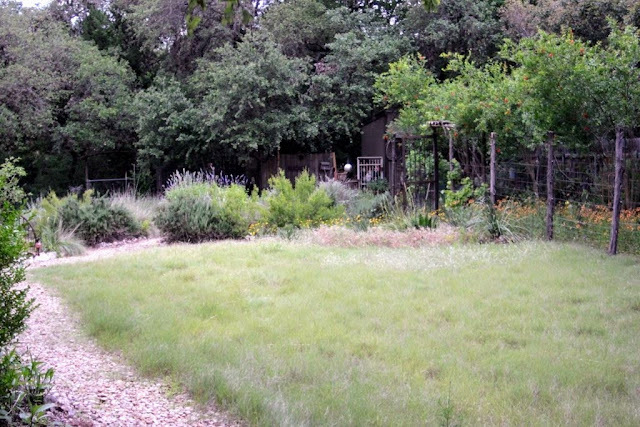 First task is to get native grasses going but Larkspur has other ideas. And my tours always end with a peek over the south side fence where it seems that as soon as I clear out potted plants from under the trees, more take their place. Now there you have it; a dual purpose spring tour of my gardens to both link up with The Patient Gardener and a place to point if someone at the Garden Blogger's Fling should ask how my garden is doing. It is doing very well, and thank you for asking. 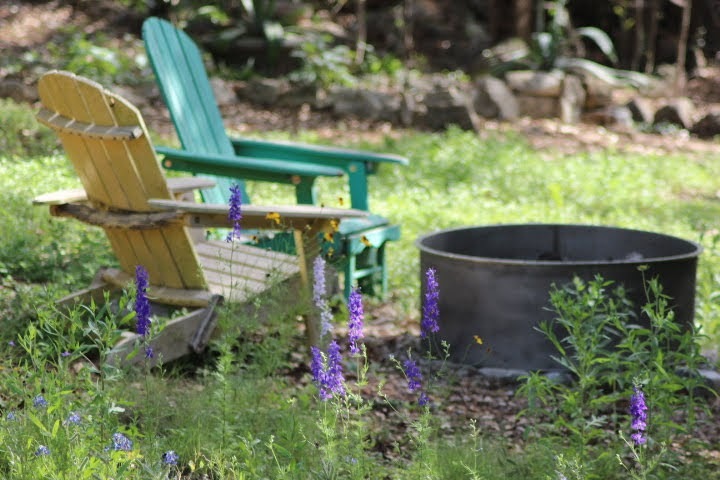 It's been a challenge to blog lately with near perfect gardening weather awaiting me. We have a short planting window in spring to ensure plants are established before the summer heat sets in. 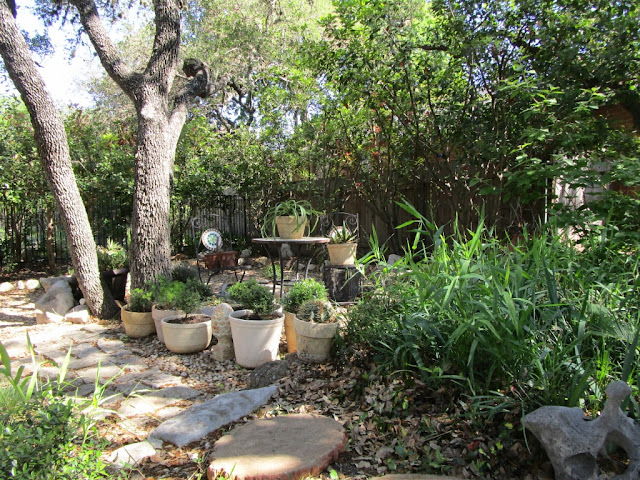 It's especially important this year since I've been moving a lot of plants to expanded areas of the garden. 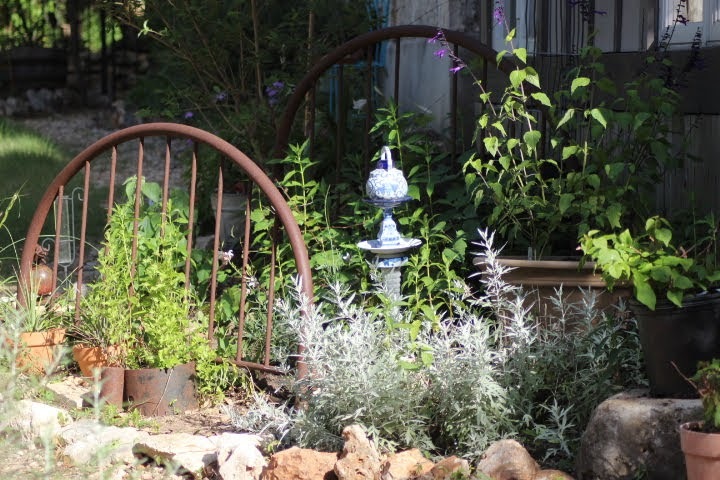 While my blogger friends farther north are digging out from their second snow storm in as many days I'm joining Carol at May Dreams Gardens for Garden Blogger's Bloom Day and sharing blooms from April in my San Antonio garden. 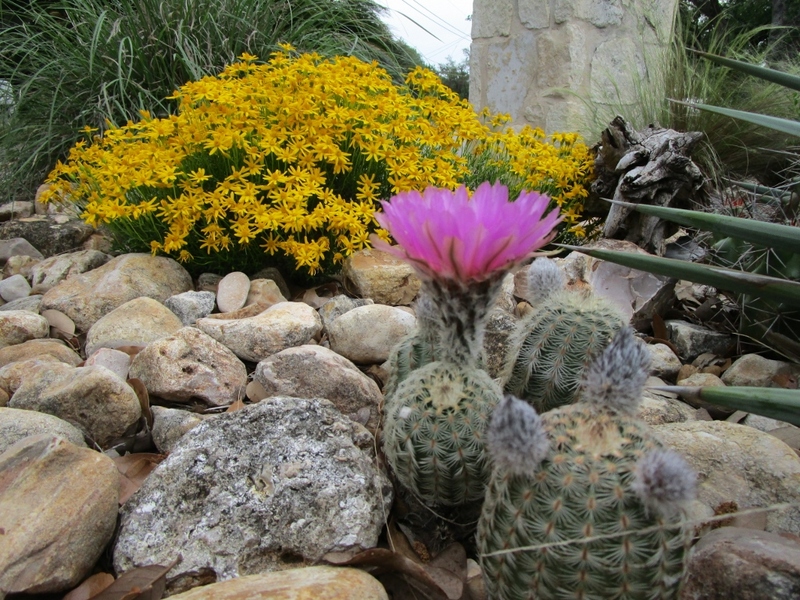 Native Lace Cactus and Damianita make a nice bright combination. This pretty cactus used to grow among the rocks in vacant areas around our neighborhood and I miss seeing it in the wild. In the back garden Belinda's Dream and Mr. Moy roses are getting along well. 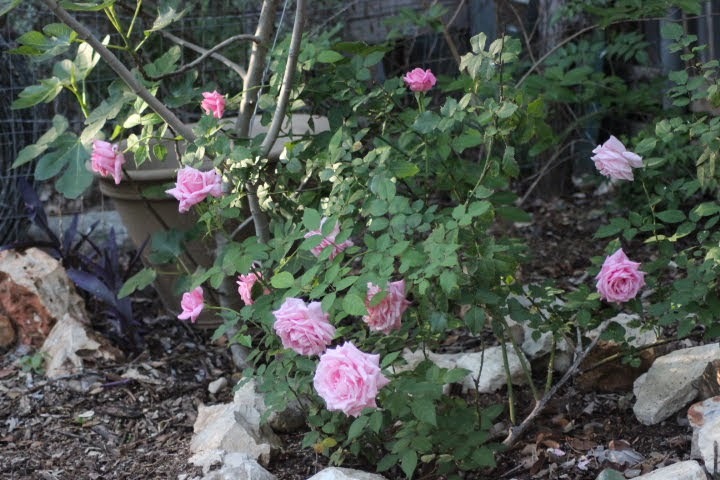 Belinda's Dream produced a dozen pink blooms at once. Beautiful! She's a good cutting rose and they last quite a while in a vase. Grandma's Yellow is still blooming too. 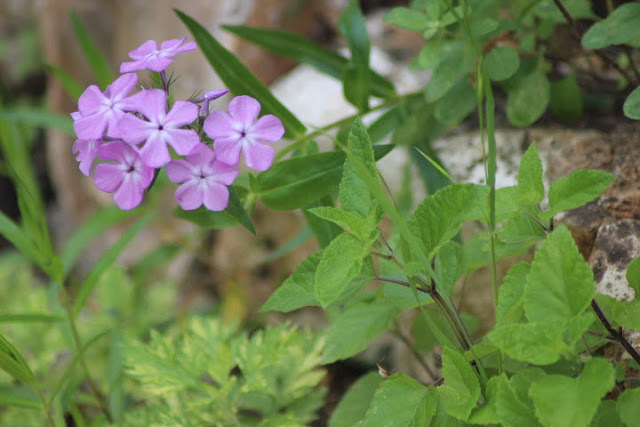 John Fanick Phlox was discovered blooming in an old San Antonio neighborhood and is named for a local nurseryman. 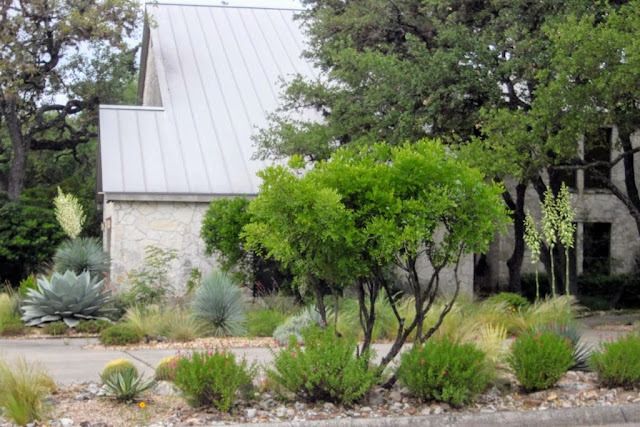 Gardening Volunteers of South Texas will be holding our April Gardening Essentials Class at Fanick's beginning noon tomorrow and you're invited. 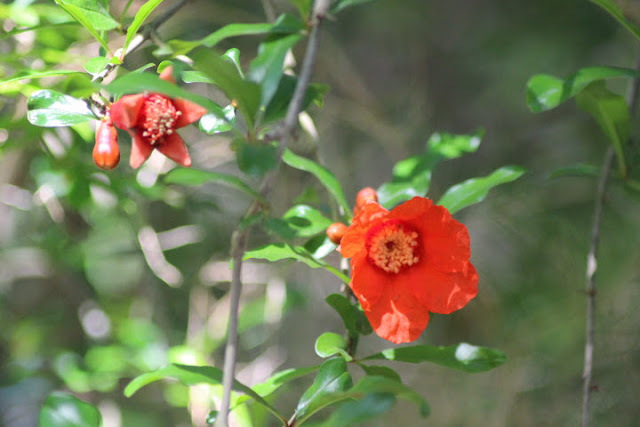 Learn more about gardening, and tour a 75-year multi-generation family business, and also get a nice discount. Pomegranate blooms are a favorite. Bright orange and a pretty shape that stands out in the trees. 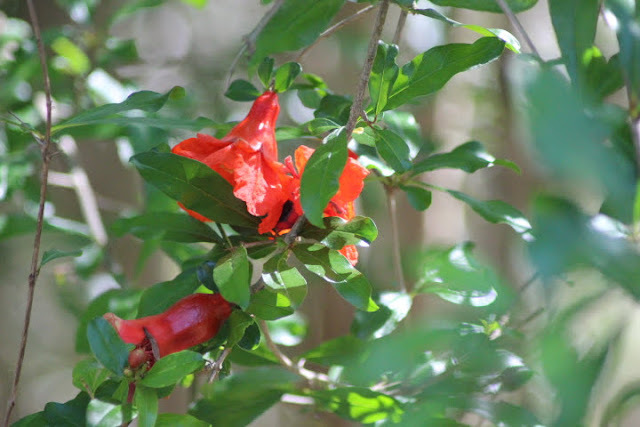 A Pomegranate forming on the lower left. We don't count on getting fruit since it is so variable with weather conditions. Henry and Augusta Duelberg Salvias bloom with little to no care. I tried the white Augusta in a separate bed but they look much better in combination with blue Henry. I think they would have liked it that way. My weeds really are wildflowers or many of them at least. 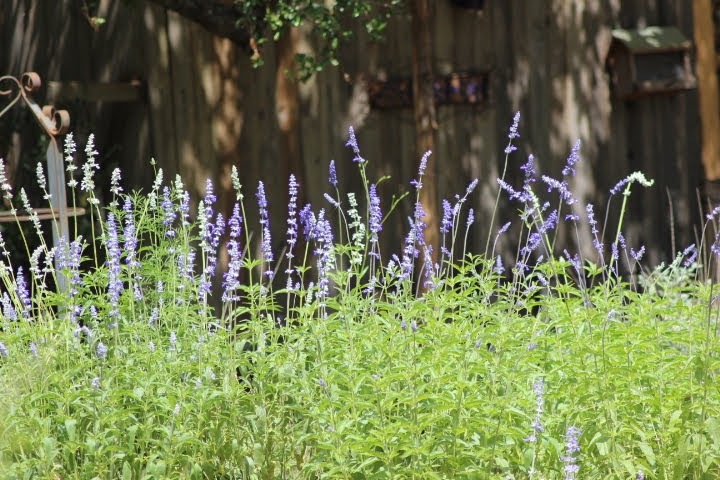 As I wait for woody perennials to bloom yellow Greenthread and Prairie Verbena fill in among Bluebonnets going to seed. 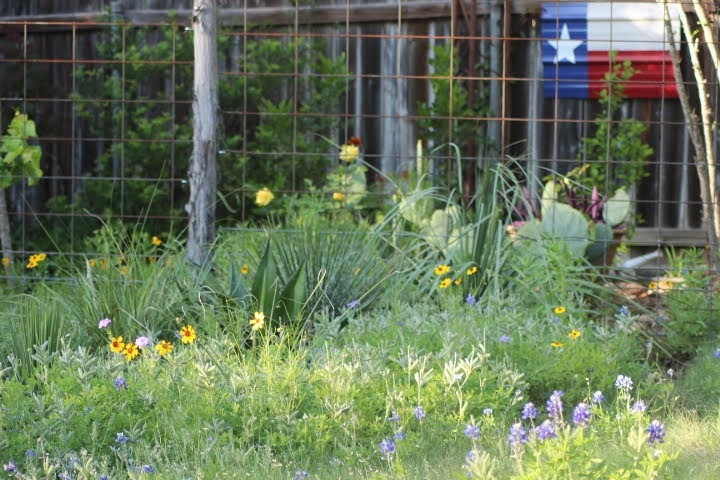 Looks like a great crop of Bluebonnets for next year. All in all a great month in the garden. That's the best of blooms from my garden for April. 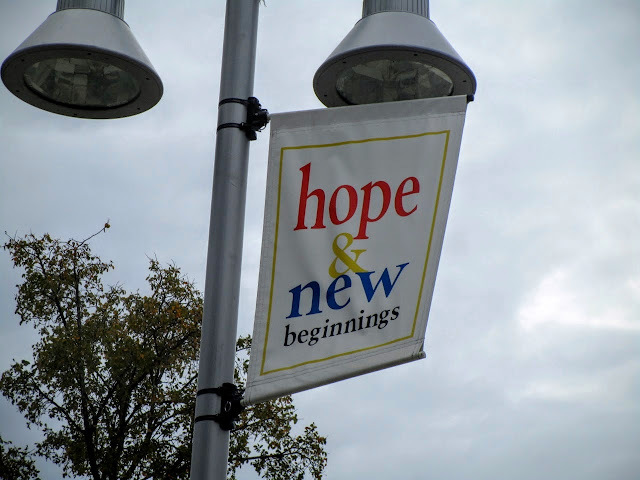 Be sure to head over to GBBD at May Dreams Gardens to see what Carol and other bloggers are sharing from their gardens. I look forward to meeting Carol and 90+ fellow bloggers at the Garden Bloggers Fling in May. 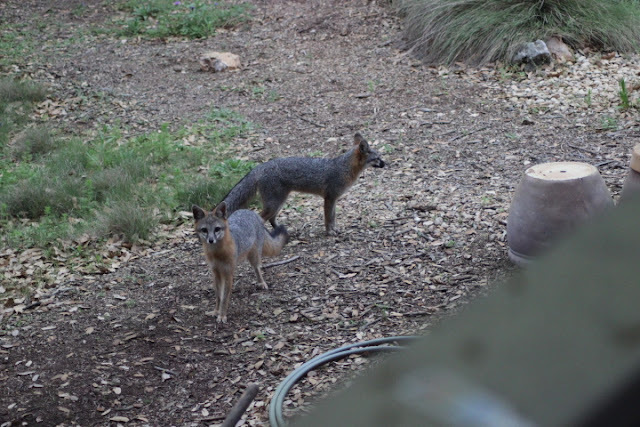 It's the first Wednesday of April and that means Wildlife Wednesday hosted by Tina at "My Gardener Says....". Wow, do I have some cool stuff from the past month of March! Even though we've continued our cool, cloudy weather longer than usual things are picking up. 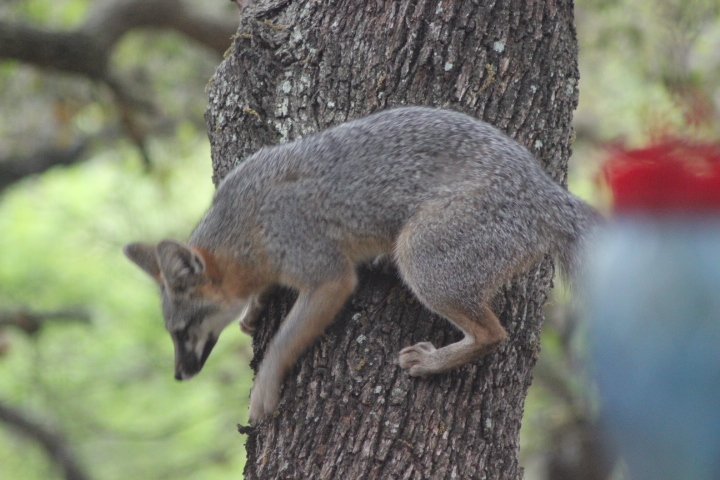 I looked out the window one morning last week and spotted this Gray Fox climbing our tree next to the deck. 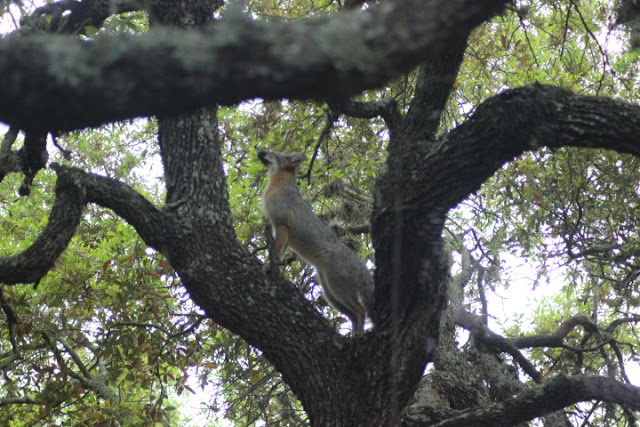 I had heard they climbed trees but imagined them walking on horizontal low branches common to our native live oaks. Not so. This Fox flattened against the tree and then climbed straight up the trunk like a squirrel or cat. 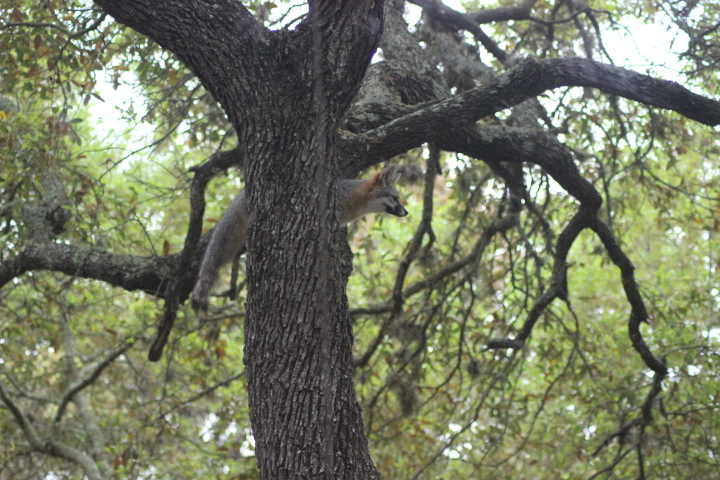 Unfortunately I wasn't fast enough to get photos of the climbing action. This is 20ft (6m) up! Searching for bird eggs or squirrels. Jumping down to the lower branch. So much fun to watch! Gray Foxes are native to North and Central America and the only canid whose range spans both. 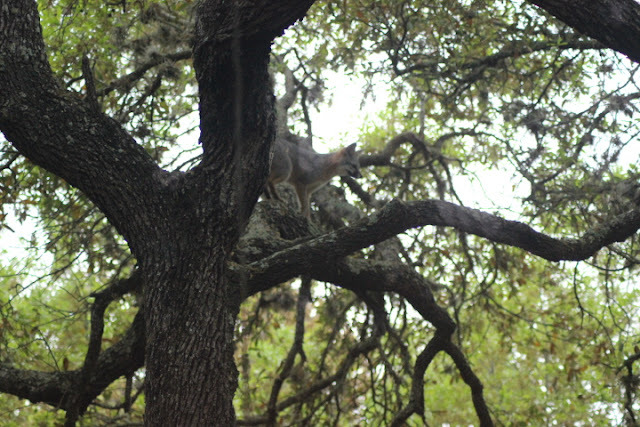 They have hooked claws which allows them to climb trees. Getting down is a little more challenging. All of the above photos were taken through the window. Now back down on the ground, it joined its mate. 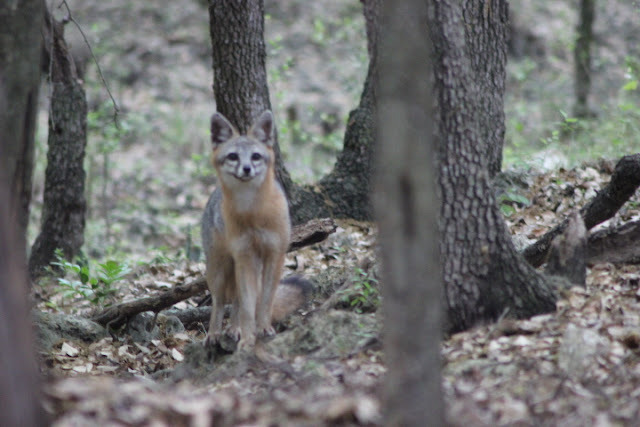 Wouldn't it be fun to find their den and see the kits? 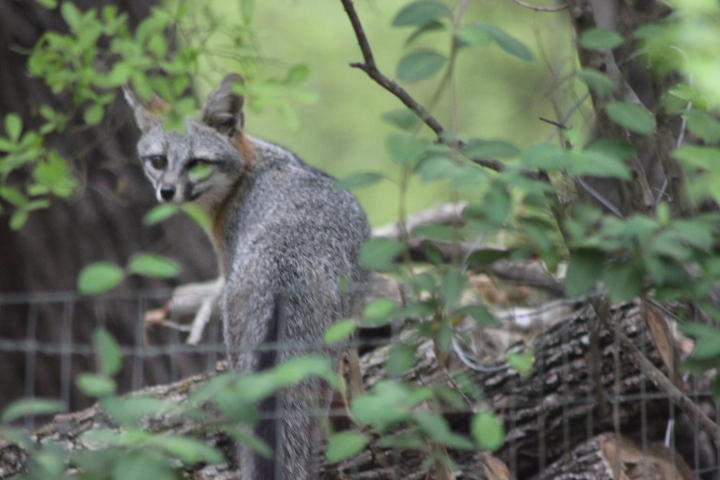 The woodpile is always popular with so many places for tasty meals to hide. Just before turning to walk away one flashed us a grin. Seems they enjoyed their visit as much as we did. 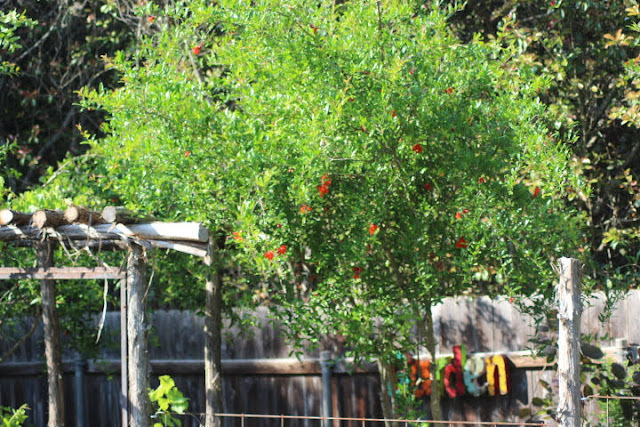 Hummingbirds are also back and I'm keeping the feeder filled since most of their favorite flowers are yet to bloom. 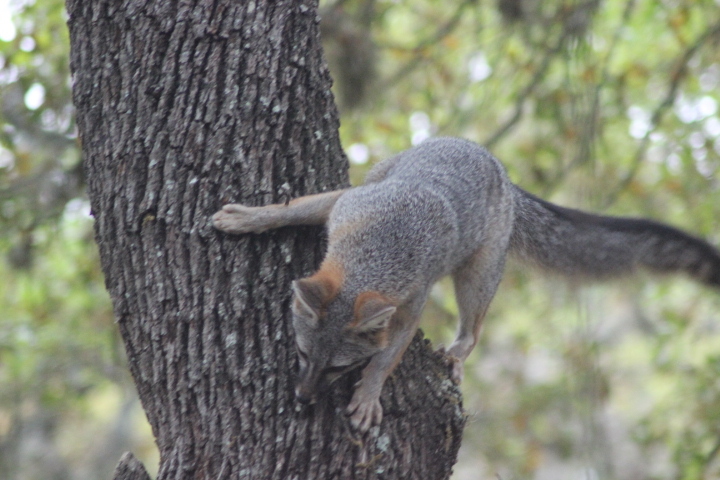 I staked out the feeder on a windy afternoon and caught this GIF. It's easy to know when to start the camera since they literally hum their approach. Sometimes they first appear sitting above to make sure all is clear. Catching them on a real flower is much more challenging. Didn't see any red so this must be a Black-Chinned hummingbird. Green Anoles have returned to the garden as the weather warms up. 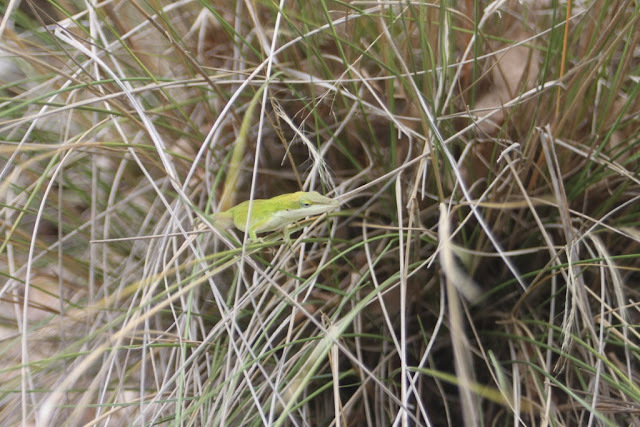 Anoles have the endearing habit of claiming a specific plant as their territory and climbing to the top to await moths and other insects. I heard one snap at a moth one day and it was quite audible. 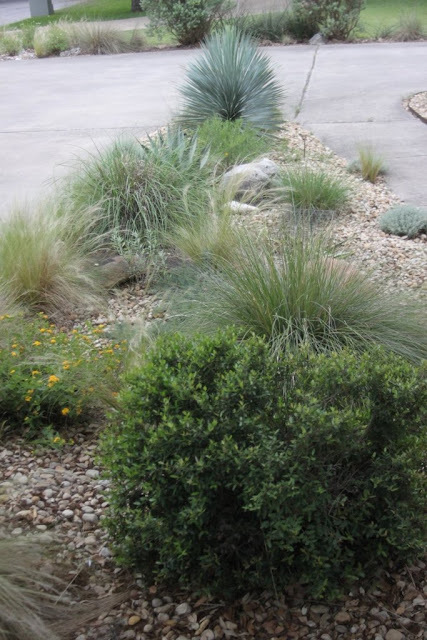 It's unclear how this muhly grass is working out since it's not as sturdy as their usual agave perches. Perhaps the agaves were all taken. Depending on their perch anoles turn a color range from bright green to brown. The change occurs quickly and is fun to watch. This one is just a few shades short of bright green. 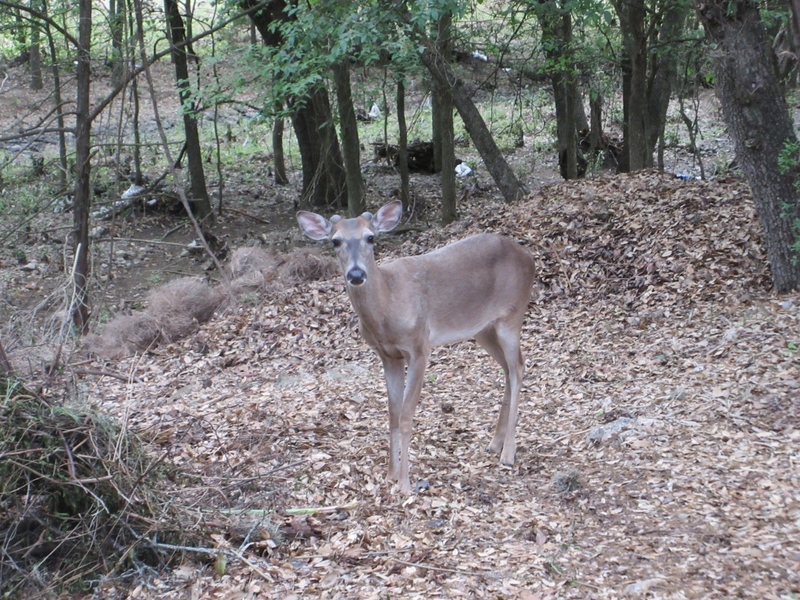 Meet "Mr. Buttons" who has been hanging out by the brush pile waiting for cuttings of Ruellia and other tasty plants. Deer shed antlers in winter after mating season and before fawns arrive. Buttons show new antlers are emerging. They're also kicked out of the herd about the same time so he's on his own waiting for food delivery. I rattle the gate when tossing deer edibles and he will walk over to inspect. That's the wildlife report for the past month. You can find more wildlife posts in the comments section at "My Gardener Says...". 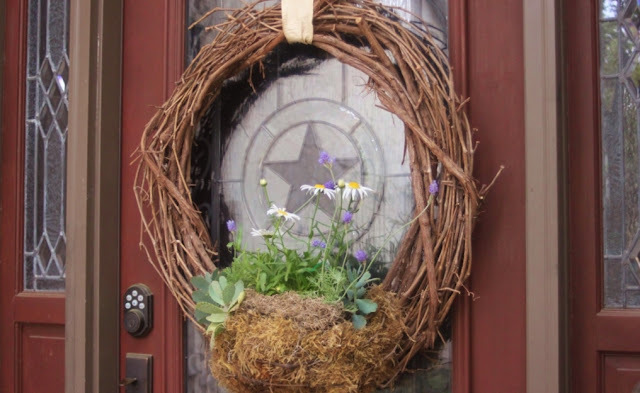 On the Door for Easter Monday! Another installment of "On the Door" as I bring back the basket planter for another season. 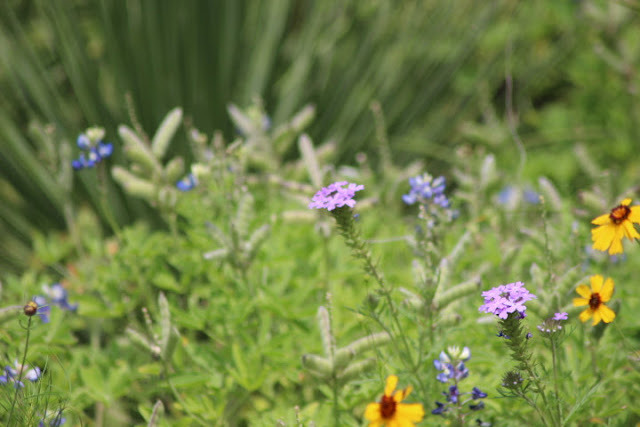 Fernleaf Lavender and Shasta Daisies with succulents make a nice combination. There's not enough light here for these to keep blooming so I'll move them to the garden and find some brighter colors for our upcoming Fiesta season. It's so much fun having this rotating selection of flowers on the door. Sunday afternoon I headed into the garden with shears to cut a few roses for the dinner table. 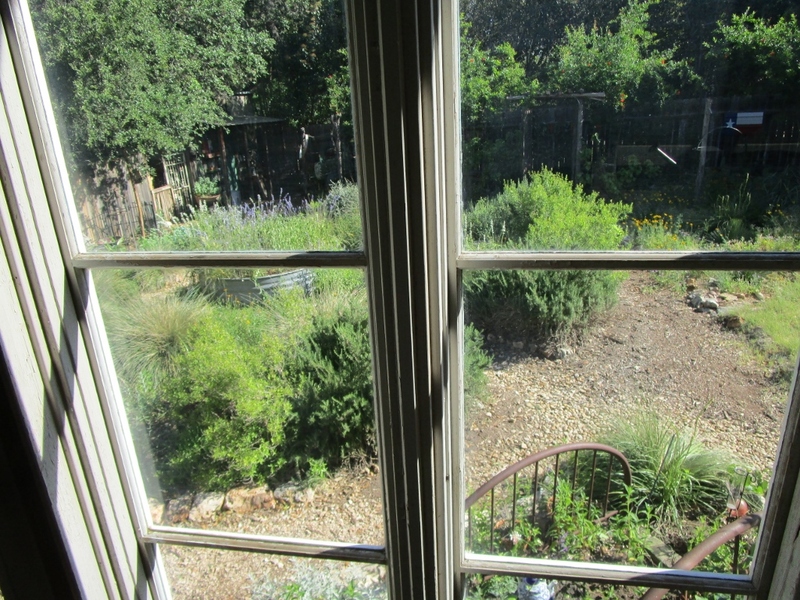 Henry Deulberg salvias, purple verbena and rosemary also made it into the mix. Back in the kitchen a plain vase awaited but I decided to use this Fox water pitcher instead. 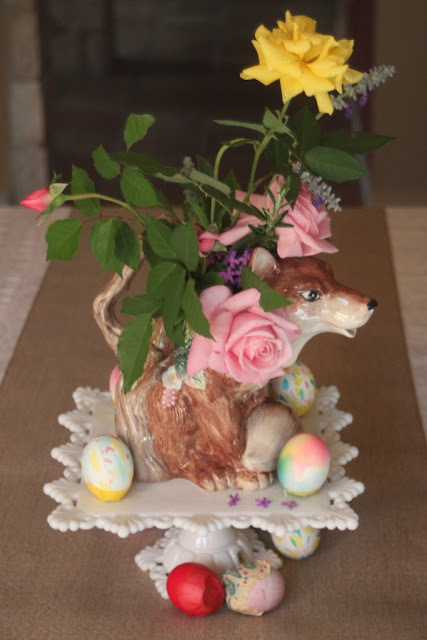 Perched on a milk glass cake stand from my husband's family (no one remembers exactly where it came from) and surrounded by cascarones it worked beautifully on the table. Most of my flowers are native wildflowers which work best outside and since I'm often in the garden I don't bring a lot of cut flowers inside. This has been a good year for roses with enough rain and I remembered to fertilize in late winter. 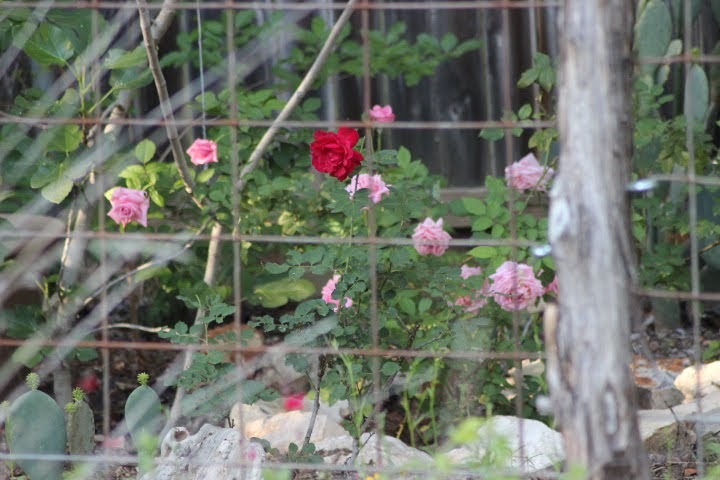 The pink roses are 'Belinda's Dream' bred in Texas to resist all that nature can throw at it and I think they succeeded beautifully. 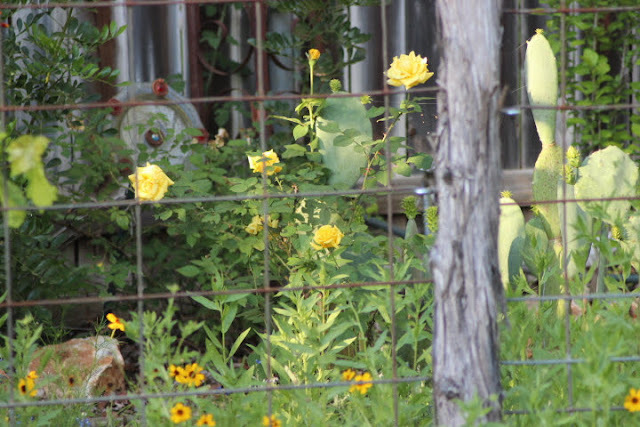 Grandma's Yellow is also a Texas rose with quite a story. 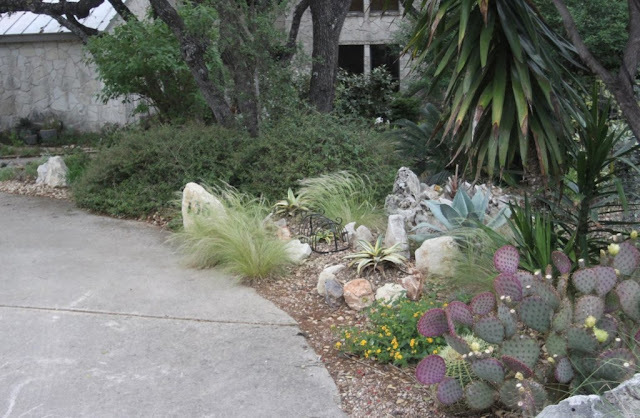 It was tested right here in San Antonio at Dr. Larry Stein's grandmother's garden. 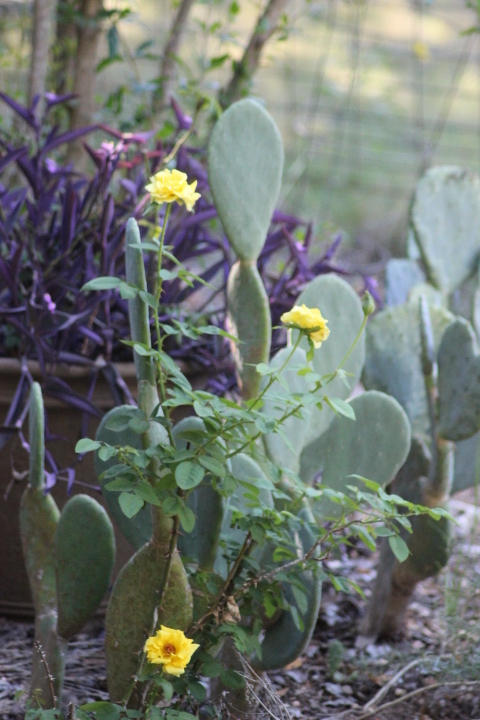 Grandma's Yellow has a lot of thorns so I solved that by combining with a spineless cactus! Hope you all had a great weekend. It's going to be a good week in the garden here in South Texas!